Background/aims To investigate outcomes following cataract surgery with and without primary intraocular lens (IoL) implantation in children under 2 years of age with congenital or infantile cataract. Method Prospective population based cohort study undertaken through the British Isles Congenital Cataract Interest Group, with systematic data collection on children undergoing surgery in UK and Ireland between January 2009 and December 2010. ORs for the association between IoL implantation and visual acuity, postoperative glaucoma and reoperation at 1 year after surgery were estimated using multivariable regression analysis to control for potential confounders. Results Of 221 children, 56/131 with bilateral and 48/90 with unilateral cataract underwent primary IoL implantation. IoL implantation was independently associated with better visual outcome in bilateral (OR 4.6, 95% CI 1.6 to 13.1, p=0.004) but not unilateral disease. IoL use increased the odds of reoperation requiring repeat general anaesthetic (bilateral OR 5.5, p<0.01; unilateral OR 16.7, p<0.01). IoL implantation did not reduce the odds of postoperative glaucoma. Conclusions The use of IoLs in cataract surgery in young children should be critically reassessed, particularly used in settings/communities where close, long-term follow-up is challenging. The absence of visual benefit and the lack of a previously postulated protective effect against postoperative glaucoma serve to question the value of IoLs in unilateral disease. The potential association between IoL use and better early visual outcomes in bilateral disease needs to be balanced against the risk of reoperation and exposure to additional general anaesthetics during a key period of neurodevelopment. Early adopters of IoLs in infancy argued three theoretical advantages. First, the potential of permanent in situ correction to offer better visual rehabilitation, argued to be especially important in children with unilateral cataract, in whom amblyopic deprivation is particularly strong due to rivalry from the unaffected eye. Second, that IoLs would be particularly useful in developing countries to reduce the need and expense associated with regular clinic visits to update contact lenses, as well as the risks of infection where access to clean water is limited. Third, some argued that IoLs could reduce the risk of postoperative glaucoma, the key sight threatening complication of childhood cataract surgery. Practitioners attracted by the potential benefits of IoL implantation for infants have adopted their use with some rapidity over the past decade,5 despite an incomplete evidence base regarding risks, benefits or patient selection. There exists no robust evidence on outcomes for young children with bilateral cataract undergoing primary IoL implantation, and limited evidence on those with unilateral disease. We report visual and adverse outcomes at 1 year after primary surgery from IoLunder2, the population based cohort study of children with unilateral and bilateral cataract undergoing surgery with and without IoLs in the first 2 years of life in the British Isles during a 2-year period. The study was undertaken through our national collaborative research network, the British Isles Congenital Cataract Interest Group (BCCIG). The BCCIG, established in 1995, is a network of ophthalmologists specialising in congenital and infantile cataract, through which key national studies have been completed.5 Following a survey of paediatric cataract surgery practice to consolidate and expand membership (n=173, see online supplementary appendix 1),5 69 surgeons at 43 hospitals across the UK and 3 in the Republic of Ireland acted as the primary respondents, identifying and reporting data on children. Any child resident in UK/Ireland undergoing surgery between January 2009 and December 2010 for congenital or infantile cataract in the first 2 years of life, with or without primary IoL implantation, was eligible for participation. BCCIG members received monthly reporting cards requesting case notification or confirmation of the ‘absence’ of cases, that is, active surveillance. Informed consent was obtained from families of eligible children. After discussions to harmonise key aspects of management (as described in online supplementary tables A,B), clinical data were collected at preoperative, peroperative, and 6-month and 12-month postoperative time points using study-specific instruments developed through the BCCIG. We used standardised definitions of the most commonly associated ocular anomalies of microphthalmos, microcornea and persistence of ocular fetal vasculature (table 1).6–10 Achievement of over 50% of prescribed occlusion/corrrective wear as reported by caregivers was coded as ‘good’ concordance. Data on potential predictors of outcome and possible child and intervention-specific confounders (table 1), agreed a priori based on previous research and biological plausibility, were collected prospectively. Visual outcome measured at least 1 year after surgery (best corrected acuity assessed using standard hospital-specific but harmonised approaches) was categorised into an ordinal scale using the normative age-related values for each test modality (see table 1 and online supplementary table C).11–13 This enabled direct comparison across different modalities. We used standardised definitions for the two most significant adverse outcomes, ‘secondary’ postoperative glaucoma (structural damage or neuropathy secondary to elevated intraocular pressure)14 and visual axis opacity (VAO) (proliferation of either inflammatory material or remnant lens fibres). Unilateral and bilateral cases were analysed separately. Data from both eyes of children with bilateral cataract were used with robust variance estimates to account for within-child correlation. We used multivariable ordinal or logistic regression, as appropriate, to estimate associations between visual outcome, incidence of glaucoma and VAO and child-specific/treatment-specific factors with adjustment for confounding factors (table 1). We investigated the correlation between potential predictors of outcome and possible confounders using non-parametrical tests (with p value threshold of 0.05 for a significant correlation). Multivariable analysis, using conventional stepwise regression, included variables significant at a 10% level in initial univariable analysis. We retained factors in the multivariable model if they altered the risk ratio estimate by more than 10% or were independently associated at a 5% significance level. We included the most clinically relevant factors, and the more statistically significant of any highly correlated factors identified from univariable analysis. We investigated the impact of missing covariate data using multiple imputation models and that of missing visual outcome data using non-parametrical testing of the differences between children with or without outcome data. Analyses were undertaken using Stata (V.12.1, StataCorp, College Station, Texas, USA). We identified 306 eligible children. Comparisons with contemporaneous statutory hospital based reporting, and anticipated incidence, suggests near complete ascertainment.15 The families of 254 of these children (83%) consented to participation. Forty-eight per cent of recruited children were female, 76% of children were of white ethnicity and 27% were in the worst quintile of socioeconomic deprivation. Primary IoL implantation was undertaken in 61/151 (40%) of children with bilateral and 55/103 (53%) with unilateral cataract. Complete postoperative data at 1 year were available for 221 of the 254 children, or 350 operated eyes. Comparing the preoperative and peroperative characteristics of children for whom we did/did not have 1-year postoperative data, there was no evidence of attrition bias. Overall, the median age at diagnosis of cataract was 1.8 weeks, and 9.2 weeks at surgery. Ocular comorbidity was common, in particular persistent fetal vasculature (53/221, 24% of children including 42/90, 47% those with unilateral cataract) and microphthalmos (133 children, 59%). Children undergoing IoL implantation were older, had larger eyes and were less likely to have coexistent ocular abnormalities at surgery than those with aphakia (table 2). Peroperative complications occurred in 36 of the 350 operated eyes (10%), with more than one complication in two eyes (0.6%). Complications were more frequent with IoL implantation: 26 (16%) eyes versus 12 (6%) eyes in the aphakia group, (χ2 test p<0.01). The most common complication was iris prolapse (15 eyes with IoLs, 3 with aphakia). Three eyes underwent peroperative implant removal due to poor fit within the capsular bag and were left aphakic. We analysed outcomes for these three children within the IoL group, consistent with the ‘intention to treat’ approach. We excluded from this analysis 18 children with preoperative ocular or cerebral abnormalities that precluded good vision (figure 1). 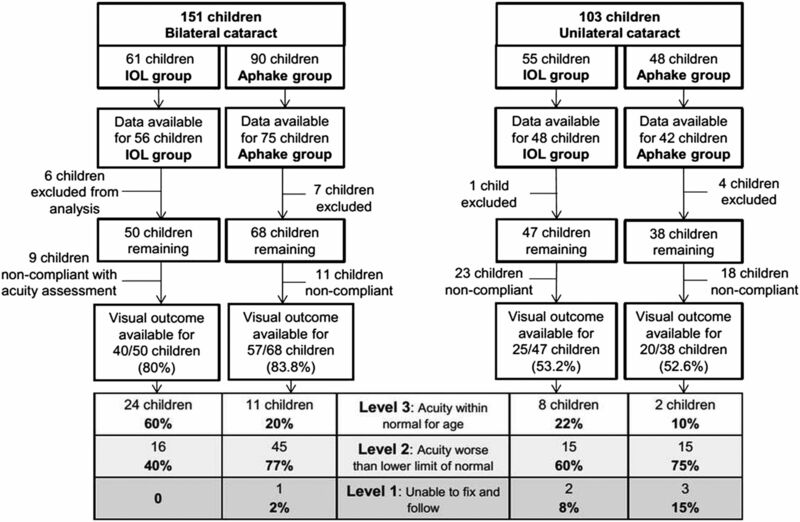 A similar proportion of children in the IoL and aphakia groups complied with formal visual assessment. Flow diagram of steps in analysis of visual outcome at 1 year following cataract surgery. IoL, intraocular lens. Overall 35 children with bilateral cataract (36%) and 10 operated eyes of children with unilateral disease (20%) had vision within the normal range for age in their better eye, or with both eyes open (figure 1). IoL implantation was independently associated with increased odds of being in a better visual category in bilateral cataract (table 3). The association between IoL implantation and better visual outcome was robust to the multiple imputation of missing data. Good concordance with occlusion therapy and the absence of postoperative glaucoma were strongly associated with better visual outcome in unilateral cataract, but IoL implantation did not result in better vision for these children. For all children (those undergoing surgery for unilateral or bilateral cataract), there was some evidence of an association of younger age at surgery with better visual outcome. Data on glaucoma outcome were available for all 221 children. Five children with preoperative glaucoma were excluded from the analysis of ‘secondary’ glaucoma. Twenty-eight of the remaining 216 children, (13%) were diagnosed with glaucoma during the first postoperative year (table 4). All had undergone cataract surgery in the first 6 months of life. Younger age at surgery was the only factor independently associated with early postoperative glaucoma in bilateral cataract: each increasing week of age at surgery reduced the odds by 2% (adjusted OR 0.98, 95% CI 0.97 to 0.99, p<0.01). Significant microphthalmia was the only independent predictor of the development of glaucoma in unilateral disease (adjusted OR 12.1, 95% CI 1.8 to 81.8, p=0.01). Data on reoperation were available for all 221 children. One hundred and five of the 350 operated eyes (30%) underwent reoperation, most of which (94/105) were for VAO (table 4). Median time from primary surgery to reoperation was 3.9 months. IoL implantation increased the odds of postoperative intervention for VAO in bilateral and unilateral cataract (adjusted OR 5.5, 95% CI 2.3 to 13.2, p<0.01 bilateral, adjusted OR 16.7, 95% CI 4.1 to 68.9, p<0.01 unilateral). These comprised corectopia (12 eyes, 3%), vitreous haemorrhage (6 eyes, all with persistent fetal vasculature), wound complications (3 eyes) and retinal detachment (1 eye). IoLunder2 is a unique prospective population based cohort study of outcomes in children undergoing cataract surgery in the first 2 years of life, with high and unbiased ascertainment. We report outcomes 1 year following primary surgery, an important milestone for families and clinicians, and likely to correlate with longer-term outcome.16 ,17 We found evidence which suggests better early visual outcome, although not necessarily normal vision, with IoLs in bilateral cataract, though there is some uncertainty about the effect size. By contrast, we found no similar evidence for unilateral disease. We found glaucoma to be a frequent complication within the first postoperative year and that IoL implantation is not protective, as had been previously postulated. Notably, while younger age at surgery is associated with better early visual outcome18 (supporting the value of screening) it is also the major risk factor for glaucoma. We also report the high rates of reoperation, especially to correct VAO following primary IoL use. There are no equivalent studies with which to compare IoLunder2 directly. A North American group has recently reported a circumscribed randomised controlled trial (the Infant Aphakia Treatment Study), of IoL implantation in infants aged 6 months or under with unilateral cataract,16 and has recommended leaving the eye aphakic in this subgroup of the target population children. Our findings of a higher rate of reoperation and an absence of better visual outcome in unilateral cataract are in agreement with their key findings. More importantly, from IoLunder2 we are also able to suggest that the use of IoLs should be reconsidered in all children under 2 years of age with unilateral congenital and infantile cataract. Furthermore, we have addressed the role of IoLs in younger children with bilateral disease, which accounts for the majority of children affected by congenital and infantile cataract, and by definition for almost all children who would be rendered severely visually impaired by the disorder. We suggest that the value of IoLs in terms of potentially better early visual outcome in this group should to be balanced against the risk of high reoperation rates which expose children to repeat general anaesthetic in a key period of neurodevelopment. Historically, the late detection of congenital/infantile cataract was one of the main obstacles to achieving good outcomes and in response, in most industrialised countries, screening programmes were implemented. The Newborn and Infant Physical Examination programme of newborn/infant screening in the UK3 resulted in half of all children in IoLunder2 being diagnosed within the first fortnight of life enabling timely treatment. Our findings of associations between younger age at surgery and better visual outcome and glaucoma serve to highlight challenges of the timing of surgery. Such decision making requires prompt diagnosis even where treatment may be deferred. It is unlikely that visual outcomes in resource-poor countries will improve without strategies for early detection. Much of the enthusiasm behind the rapid adoption of IoL use internationally has been the potential through a ‘one off’ intervention to achieve some degree of ‘permanent’ refractive correction, compared with the use of aphakic glasses or contact lenses for visual rehabilitation in settings where regular healthcare contact cannot be guaranteed. Our findings, and those of the recently reported others,16 should be reviewed in the context of the growing body of evidence relating to the possible association between multiple general anaesthetics in early childhood and long-term cognitive impairment.23 We suggest clinicians should now critically review practices. The longer-term follow-up of the IoLunder2 cohort will identify the trajectories of visual development, and by capturing a ‘final’ acuity outcome will clarify whether the positive association between IoL use in bilateral disease and better visual outcome persists and its magnitude. More generally, we suggest that IoLunder2 exemplifies the importance of rigorous observational epidemiological research in the evaluation of surgical innovations for uncommon disorders, ahead of widespread adoption. NHS UK National Screening Committee. Newborn and infant physical examination. 2008. http://newbornphysical.screening.nhs.uk/evidence (accessed 3 Nov 2014).
. Corneal diameter and axial length in congenital glaucoma. Can J Ophthalmol 1985;20:93.
. Large sample population age norms for visual acuities obtained with Vistech-Teller Acuity Cards. Invest Ophthalmol Vis Sci 1995;36:657–70.
. Monocular acuity norms for the Teller Acuity Cards between ages one month and four years. Invest Ophthalmol Vis Sci 1995;36:671–85.
. Capture-recapture analysis of ascertainment by active surveillance in the British Congenital Cataract Study. Invest Ophthalmol Vis Sci 1999;40:236–9. Collaborators British Isles Congenital Cataract Interest Group. Contributors ALS designed the data collection instruments, undertook data collection at 18 sites, coordinated data collection at the remaining sites, carried out the analyses and drafted the initial manuscript. IR-E designed the study and critically reviewed the manuscript. PMC supervised analysis and critically reviewed the manuscript. JSR conceptualised and designed the study, supervised data collection at all sites, supervised analysis, and critically reviewed the manuscript. All authors approved the final manuscript as submitted. JSR is the guarantor of the manuscript and affirms that the manuscript is an honest, accurate and transparent account of the study being reported; that no important aspects of the study have been omitted; and that any discrepancies from the study as planned have been explained. All authors had access to study data and can take responsibility for the integrity of the data and the accuracy of the data analysis. Funding Ulverscroft Vision Research Group; Great Ormond Street Hospital/UCL Institute of Child Health National Institute for Health Research (NIHR) Biomedical Research Centre; Moorfields Eye Hospital NHS Foundation Trust/UCL Institute of Ophthalmology National Institute for Health Research (NIHR) Biomedical Research Centre. The funders had no role to play in study design; in the collection, analysis and interpretation of data; in the writing of the report; or in the decision to submit the article for publication. Ethics approval The study was approved by the joint UCL/UCLH (ref 08/H071/65), and the Dublin (ref SAC/121/09) Research Ethics Committees.